The M16A2 replaced the M16A1 in U.S. Army service in 1983. It is essentially an improved M16A1. Major changes include: a switch from full automatic to 3-round burst capability; a heavier barrel; improved sights; new, stronger plastic buttstock, handguard, and pistol grip. The M16A2 is a further development of the standard U.S. battle rifle since 1967, the M16A1. The weapon was originally designed by Eugene Stoner, of Armalite. Production was licensed to Colt in 1959 and the weapon gradually replaced the M14 in U.S. service through the 1960s. The weapon, chambered for 5.56x45mm NATO calibre, has been a mainstay of the U.S. military ever since. The weapon can be fitted with a 40mm, single-shot grenade launcher. See M203. 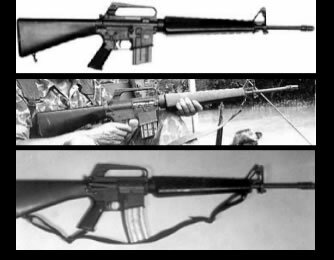 When M16 was designed by Eugene Stoner from the Armalite Company it was as the AR-15 around 1956. The AR-15 was licensed to Colt Manufacturing Company, who modified and renamed the AR-15 model to the M16 and later the M4. Later on Eugene Stoner founded an weapons manufacturing together with C. Reed Knight. The Knights / Stoner Company still build the AR-15 for the public market. The barrel of the M16 was enhanced around 1967 due to an issue with casings jamming in the chamber, and the new version of M16 was named the M16a1. After solving the barrel problems the M16/M16A1 soldiered on for the remainder of the Vietnam War without problem.